Hello to my favorite readers! 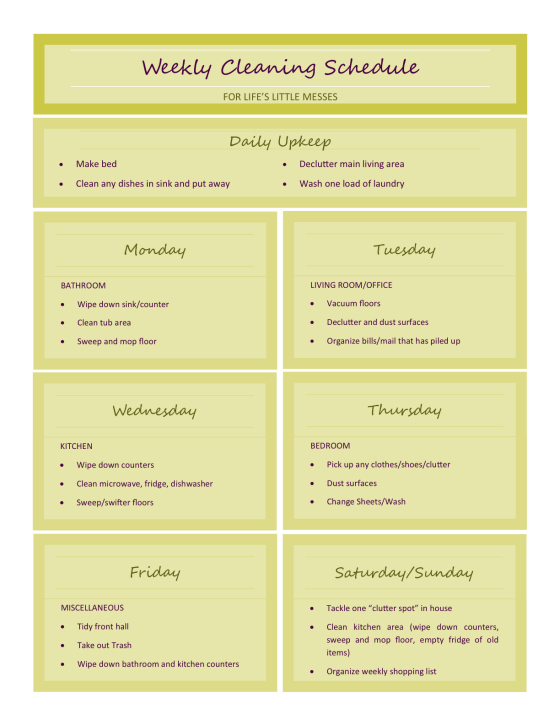 I am going to be trying out something new in our house and I thought you might want to play along too. Every time Saturday morning rolls around - I experience the same wave of emotions. I sleep in, brew a cup of coffee and smile to myself as I explore Pinterest while sipping on my coffee. I am relaxed and happy that it is the weekend. I can put my feet up and relax. Then I come crashing down to earth as I look around me. The living room needs to be dusted and picked up, there is mail piling up on the kitchen table, my clothes are all over the place in my 'Get Ready' room aka the spare bedroom where I keep all of my clothes and shoes, and the tub needs to be scrubbed. UGH! Nothing worse than having a full day of cleaning ahead of me when all I want to do is chill out. GB is so sweet and always offers to help me, he wants to be involved, and in fact does many of the household chores already. But I hate the way he cleans. I don't know if you have ever experienced this with anyone - but in my humble opinion, he does it all wrong. He always wants to start by sweeping before I have cleaned off the counters or dusted. It makes no sense. Or he'll wash the dishes but refuse to dry them and put them away. It drives me crazy. I appreciate his help and willingness to pitch in, but I always end up telling him to do something else and I do the majority of the cleaning. Well, I think I have found a solution. 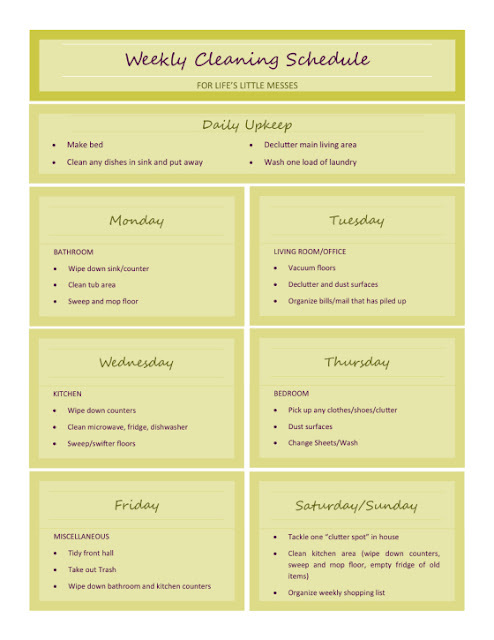 All over Pinterest are weekly cleaning charts that eliminate the need for the big weekend clean up. I am going to give the below list a try this week. I'll update you next week to see if this actually works. This list comes from Rachel at Petite Siansa. Wish me luck! Let me know if you play along too! I'd love to hear how it goes for you! URG we are doing the same thing in our house and we are both doing it... I've had to vacuum the house twice in the last two weeks.